The Web Marketing Association judges will select the best social media campaigns in 86 industries as part of their 17th annual Internet Advertising Competition (IAC) Awards. Anyone wishing to nominate their social media work for consideration may do so at http://www.IACAward.org before the deadline of January 31, 2019. Boston, MA, November 18, 2018 –(PR.com)– The Web Marketing Association judges will select the best social media campaigns in 86 industries as part of their 17th annual Internet Advertising Competition (IAC) Awards. The IAC Awards are the first and only industry-based advertising award competition dedicated exclusively to online advertising. Anyone wishing to nominate their social media work for consideration may do so at www.IACAward.org before the deadline of January 31, 2019. “Marketers using social media, like Facebook, Pinterest, Instagram, and Linkedin, to engage consumers is exploding,” said William Rice, president of the Web Marketing Association. Using either apps or pages can an effective advertising tool to build brand awareness and engage consumers using social media. The IAC Awards provides an opportunity to show the world your expertise in this emerging field. It’s also a great marketing opportunity for the winners to promote their work to senior management, customers and prospects”. 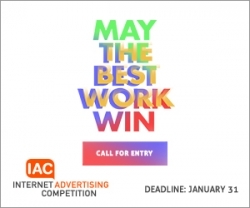 The 2019 Internet Advertising Competition Awards are open to all organizations and individuals (advertising and interactive agencies, corporate marketing departments, etc.) involved in the process of developing Internet advertising. Entries may be submitted online at http://www.iacaward.org. The deadline for entry is January 31, 2019 and will be judged on creativity, innovation, impact, design, copywriting, and use of the medium. Interactive agencies that win multiple awards will also be in the running for Top Agency Award. Each entrant will be awarded points based on the level of award for each award received. A Best of Show will be worth 5 points, Best of Industry 3 points and each Outstanding award 1 point. The agency with the most points will be awarded the Top Agency Award. Judging for the IAC Awards will take place in February, 2019. Judges will consist of a select group of Internet advertising professionals with an in-depth understanding of the current state-of-the-art in Web advertising. Past competition judges have included top executives from leading corporations, institutions and media organizations such as Arc Worldwide, Beeby Clark+Meyler, Brunner Digital, Campbell-Ewald, CNN, Deep Interactive Asia, Digitas, EuroRSCG 4D, Google, IBM Interactive, JWT, Mastercard, McCann Worldgroup, Possible, SapientRazorfish, Starwood Hotels & Resorts, Small Army, Tectis GmbH, TMP Worldwide, Universal McCann Interactive and Wunderman / Y&R. The 2019 Internet Advertising Competition Awards are sponsored by iContact, PR.Com, EContent Magazine, WebMaster Radio and Website Magazine. The Web Marketing Association is an organization working to create a high standard of excellence for Web site development and marketing on the Internet. Staffed by volunteers, it is made up of Internet marketing, advertising, PR and design professionals who share an interest in improving the quality of online advertising, Internet marketing and promotion used to attract visitors to Web sites. The Web Marketing Association’s annual award programs, the WebAward Competition, MobileWebAwards and the Internet Advertising Competition Awards, have been helping interactive professionals promote themselves, their companies, and their best work to the outside world since 1997. Next articleIs There a Difference Between a Promo and Discount?